Robust, heavy duty, steel-framed 25 metre extension cable reel. Heavy duty rubber plug and 2 x 240V drum-mounted 13A sockets. 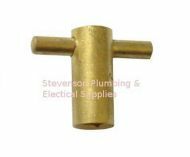 4 inch test plug - used to temporarily block waste / soil pipes. 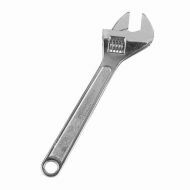 Drop-forged chrome plated adjustable spanner / wrench. Polished jaw face, smooth jaw adjustment. Length 250mm - Jaw 30mm. This adjustable tap back-nut wrench is just what you need to reach those awkward tap back nuts. Fully hardened jaws, easily reversible. 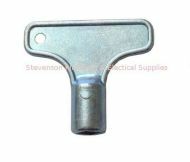 Alloy vent key for bleeding air out of your radiators. Easy grip brass vent key for bleeding air out of your radiators, in the style of an old clock winding key. Keep it on your keyring, so you always have it to hand. Brass vent key for bleeding the air out of your radiators. 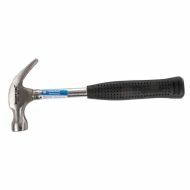 General purpose, tubular shaft 16oz claw hammer with steel shaft, polished head and thick heavy duty rubber handle. Cutter for copper pipe / tube, suitable for sizes of pipe from 3mm to 30mm. Cramer bath rubber removes paint marks, adhesive residue, lime scale, metal abrasions and tough stains on baths, basins, ceramic sanitary fixtures, sinks, tiles, floors and more without scratching. The Cramer Bath and Kitchen Repair Kit is able to repair and restore damaged baths, sanitary ware and kitchen appliances by making near invisible and permanent repairs to chips and scratches. Suitable for covering marks, blemishes and small scratches to enamel, acrylic and ceramic surfaces in the bathroom and kitchen. For clearing blocked waste pipes. Cork screw end and integrated handle. Water pump compatible with most standard power drills. Pumps up to 1,500 litres per hour, up to 10m horizontally. Strong nylon body. 3/4 inch BSP male threaded connections. Only suitable for non-acidic and non-flammable liquids. Bending spring for 10mm copper pipe, external type, goes over the pipe / tube. Stops pipe from kinking as you are bending it. This spring fits over 10mm copper pipe, the spring itself does not measure 10mm. Bending spring for 8mm copper pipe, external type, goes over the pipe. This spring fits over 8mm copper pipe, the spring itself does not measure 8mm. 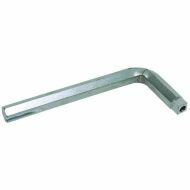 This traditional plumbers tool is an all purpose wrench and by means of the hardened fulcrum bolt, grips the workpiece tighter as more pressure is exerted. 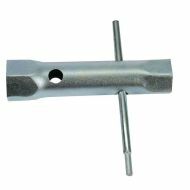 The screwdriver type end is useful for a number of different applications. 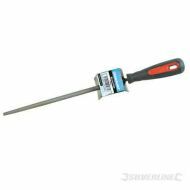 Full size hacksaw with cast aluminium handle and high-tension blade tightening mechanism. Carbon steel blade and rubber-grip handle. Quality 300mm 24 TPI bi-metal hacksaw blade. Measures 300mm between centres of mounting holes. 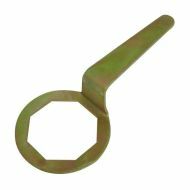 Heavy gauge steel box wrench with tommy bar, just the tool you need to remove or install an immersion heater element from a hot water cylinder. Suits standard immersion heater elements (approx 85mm across flats on nut). Spring for bending 15mm copper pipe, spring stops the pipe from kinking. This spring fits inside 15mm copper pipe, the spring itself does not measure 15mm. For bending 22mm copper pipe, spring stops the pipe from kinking. This spring fits inside 22mm copper pipe, the spring itself does not measure 22mm. 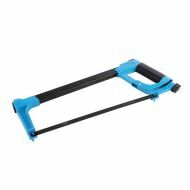 Junior hacksaw with thick, powder coated 6mm wire frame. Includes one flexible fine tooth blade. 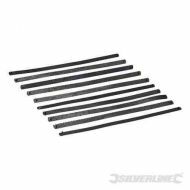 Pack of 10 x 150mm junior hacksaw blades. Strong, flexible long life carbon steel. Triangle end opens many outdoor water, gas and electric meter utility boxes / service cabinets. Square ends suit quite a few plumbing valves. 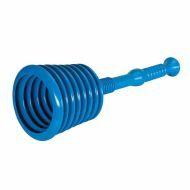 Plastic sink plunger with large 160mm head for easy blockage removal, head detaches for cleaning. It is quite large so works in most toilets as well as sinks. Key / handle to suit the lockshield outside bib-tap we have in our store. The square part on the tap that this key fits onto measures 6mm across the flats. Also suits many other plumbing valves. 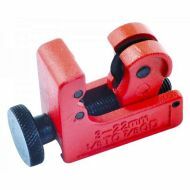 Mini pipe cutter for copper pipe, with all metal construction. Cuts pipe from 3mm to 22mm, including the popular sizes 4mm, 5mm, 6mm, 8mm, 10mm, 12mm 15mm and 22mm. Pipe bender with strong aluminium body and heavy duty hinge. 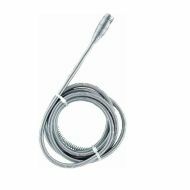 Bends 6, 8 and 10mm copper and aluminium tubing, up to 180°. 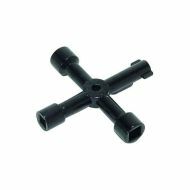 Monobloc tap back nut spanner set, ideal for fitting monobloc basin and kitchen sink taps in restricted access areas. 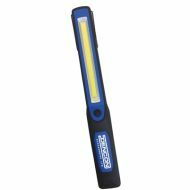 Chrome vanadium steel, with easy-grip matt finish, each part can connect together to make a really long tool. Sizes 8/9, 9/11, 10/11, 12/13mm. The Monument 15PC automatic copper tube and pipe cutter is specifically designed to cut 15mm copper pipe in areas with restricted access. Made in Britain using a strong ABS plastic case and an internal mechanism made from steel. 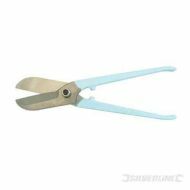 The Monument 22PC automatic copper tube and pipe cutter is specifically designed to cut 15mm copper pipe in areas with restricted access. Monument crowsfoot basin wrench with two jaws (small and medium sizes). 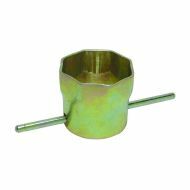 Used for loosening and tightening nuts in awkward positions, particularly those underneath sinks, basins and baths - such as those on taps / faucets. Pad saw with large, comfortable, soft-grip handle and extra-sharp teeth. Great for cutting circles and shapes in timber and board. 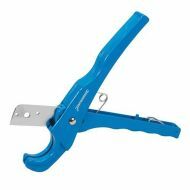 Plastic pipe cutter with 36mm jaw, die-cast aluminium body and hardened, tempered steel blade. Cuts PVC conduit, MDPE / alkathene / polythene / PVC pipe, rubber and neoprene hose. 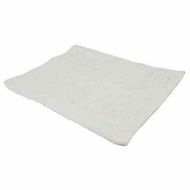 Essential for safe soldering, this lightweight and flexible plumbers heat insulation mat is approx 300 x 250mm. Heat-resistant woven glass fabric mat protects surrounding areas when soldering or brazing. Resists temperatures up to 600°C. 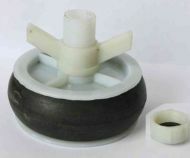 WRAS approved PTFE tape, 12m long, for sealing threaded plumbing connections. P.T.F.E. stands for Polytetrafluoroethylene, though it's often called white tape, thread tape or plumbers tape. 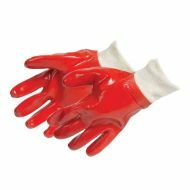 Pair of red PVC gloves. Heavy duty construction for general usage. Fully dipped polycotton interlock liner. Abrasion resistant, grease and oil repellent. Superior sensitivity and flexibility with knitted wrist for comfort. 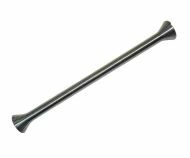 1/2 inch hex key / spanner, specially designed to install or remove the tails of union type radiator valves that are screwed into a radiator. This IS NOT the tool you need to operate the air vent at the top of your radiator. Often called a Veha key, this rear access radiator vent key has the same square innards as an ordinary vent key, but it is much slimmer. Some radiators are fitted so close to the wall that an ordinary key will not fit - this one will. 250mm engineers round file. Second cut approx 36 teeth per inch. Soft-grip handle with hanging hole. 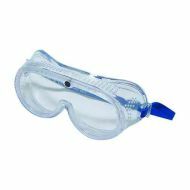 Safety goggles with soft flexible PVC frame, polycarbonate lens. Wide vision. Direct ventilation. Conforms to EN166. 5m roll of black self amalgamating tape. Waterproofs and insulates electrical connections. Bonds to itself to make a tight bandage. Easy screw adjustment for controlled grip, quick release screw and lever adjustment. Set of three tough hardened and tempered steel files. Including : 150mm flat file, 150mm round file and 175mm three square file. Silicone skeleton cartridge gun, for applying sealants and adhesives. Max capacity 400ml, pressed steel frame, handle with plunger and release clip. Specially formulated rubber block with ultra-fine diamond powder (pack of 2). Removes grout-staining scuff marks, colour spots, rust, limescale, metal marks, adhesive residue and heavy soiling. 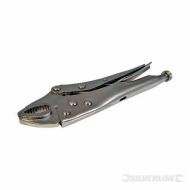 Water pump pliers with tough, chrome vanadium steel slim-jaw, narrow head for working in confined spaces. Versatile, 7-position positive locking head with hardened locating mechanism and jaws. Comfortable hi-grip vinyl handles. Length 300mm - jaw 50mm. 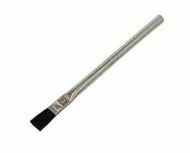 Use this brush to apply flux when making solder plumbing joints, also suitable for general workshop use. Metal handle with crimped bristles reduce damage from corrosive substances. Small pad of steel wool, also known as wire wool or wire sponge. Useful for cleaning copper pipes before soldering. 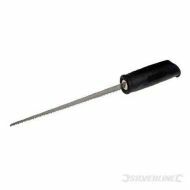 Forged steel handle, deeply serrated and hardened jaws, easily and quickly adjustable. Length 350mm - jaw 70mm. Heavy duty, double-ended box spanner (27mm and 32mm). For quick assembly of tap backnuts on bathroom basins and kitchen sinks. 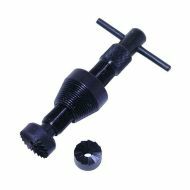 Includes 3/4 and 1 inch hardened cutters. 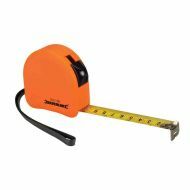 Quality 5m tape measure with ABS case, blade lock, belt clip, hand strap and auto blade return. Clear metric and imperial graduations with joist centre marks every 16 inches. Traditional style tin snips with hardened steel blades and anti-nip lugs on handles. Locking action secures blade in an open position, supplied with 10 heavy duty, standard utility blades. 90mm long in closed position. Quick-release lever for easy blade change. You must be 18 or over to buy this item. 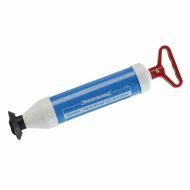 Injects a high pressure blast of water into the waste pipe removing blockages. Suitable for bath, sink and shower wastes. 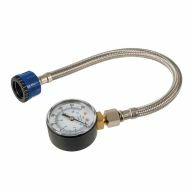 Water pressure test gauge to test mains water pressure up to 11 bar and to assist with water flow-rate calculations. Intended for domestic household use only and not for commercial use. 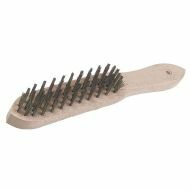 Heavy duty wire brush with wooden handle and 4 rows of steel bristles. Bristle length 20mm, length 290mm.